Beginners very welcome, try any week, no joining fees! Taina ‘K’ Kortelainen is a professional dance teacher with extensive repertoire of Zumba, Ballroom, Latin, Swing and Blues Dancing. 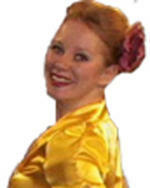 She has been teaching groups of various sizes for the past 17 years, 12 of which in London. Taina is happy when she sees people enjoying themselves on the dance floor no matter what discipline! She has now relocated to Manchester and Zumba lessons are up and running in Central Manchester, in Studio 25 on Church Street! See you in Zumba Fitness Class! Swing, Balboa, Charleston & Foxtrot at the Holborn Hop! 2 rooms of freestyle, 5 dance classes, bar & a great evening out! No need to book - Just Turn Up Any Week! What if I have prepaid a set of 4? If you have to change the date / time of the lesson you can do so once without any cancellation fee as long as you let me know at least 48 hours beforehand. If you change the timings less than 48 hours before the lesson, you will need to pay 50% of the fee. If you have to cancel the lesson completely there is always a 50% fee; if you cancel less than 48 hours before the lesson, you will need to pay the full fee (ie if you had booked a 2 hour lesson, full fee would be £90). Studios tend to have very strict policies and usually there is no change of getting a refund of the studio hire. If you have to change the timings of the lesson you will have to pay the studio charges as apply to your lesson. For the teaching part: you can change timings once without any cancellation fee as long as you let me know at least 48 hours beforehand. If you change the timings less than 48 hours before the lesson, you will need to pay 50% of the fee. If you have to cancel the lesson completely there is always a 50% cancellation fee on top of the studio charges (ie if you had booked a 2h session, the cancellation fee would be £35 (ie 2x£35/2); if you cancel less than 48 hours before the lesson, you will need to pay the full teaching fee on top of the studio charges.